The first coast to coast solar eclipse in 99 years drew millions outside in the middle of the day throughout the country. Even if you weren't in the path of totality, many parts of the United States were able to see at least part of the show. Here in Philadelphia we reached close to 80%. 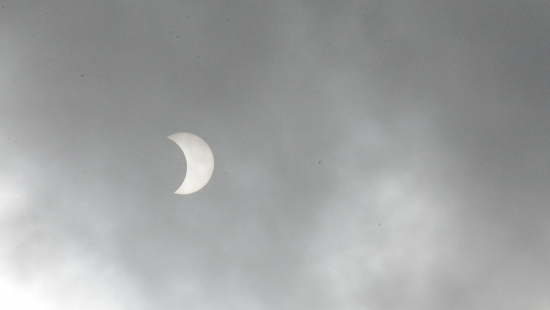 A few clouds did pass by at the time of the peak coverage but it was great viewing for most of the afternoon. If you were lucky enough to get a glance through a pair of eclipse glasses it was a great sight. Office buildings and neighborhoods emptied in the streets with people looking to catch a glimpse. Mark your calendars because in 2024 that path of totality will get closer when a total solar eclipse happens in parts of Western Pennsylvania. The statue of former mayor and police commissioner Frank Rizzo was in the spotlight again on Monday after a week of heated debate, protest, and vandalism. Sunday night, supporters of the late politician struck a deal with the city to postpone a planned rally at the statue on Monday afternoon in exchange for meeting with Mayor Kenney. A small group of protestors who want to see it removed did gather in front of it during the Monday afternoon rush hour and stopped traffic. Kenney says that there has not been a decision made on the statue but it will be coming soon. The renewed focus started last week when Councilwoman-at-large Helen Gym tweeted a call for its removal. In a statement today, she said "We must proceed with a dialogue on his rightful place in history peacefully and respectfully... There will be a City-led public process for moving the Rizzo statue to a location better reflective of its complicated history. Monuments are not about permanence; they move and change as cities evolve." A Camden, NJ, man was indicted by a grand jury on Monday on drug possession charges after an investigation uncovered a record-setting amount of the synthetic opioid fentanyl. 23-year-old Yahmire Boardley was first arrested in March. A joint investigation by state and federal authorities found that large quantities of the drug were being shipped to various locations throughout Camden maintained by Boardley. In total they found 31 pounds or 14 kilograms. Fentanyl is much more powerful than heroin. Dealers often cut the drugs together making a lethal combination responsible for ever increasing overdose deaths. New Jersey State Attorney General Christopher Porrino said in a statement that the amount of fentanyl seized in this bust "could have yielded upward of five million lethal doses, enough to kill more than half the population of the state of New Jersey."